TechFab Metal Gabion - Mattress is a double twisted wire mesh container uniformly partitioned into internal cells with relatively small height in relation to other dimensions, having smaller mesh openings than the mesh used for TechFab Metal Gabion. Tech Mattress are generally used for river bank protection and channel linings. 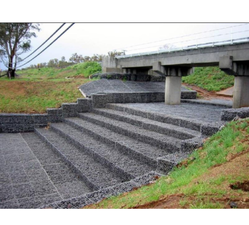 - Retaining structures in non aggresive environments. It is a high quality fencing mesh and can be made out of low carbon steel (MS) wire, galvanized (GI) wire, stainless steel (SS) wire . Chain link fence is one of the most traditional and versatile form of wire fencing. Owing to our in-depth knowledge of this domain, we are specialized in providing Gabion Mattress. Gabion Box are mechanically woven double twisted hexagonal woven wire mesh baskets of various sizes and dimensions. 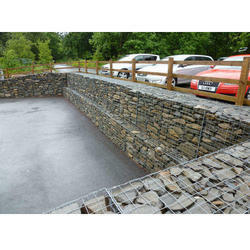 Gabion baskets are filled with G natural stone to create flexible monolithic gravity mass structures.